Here we are mid April and Sydney is still having very hot days in the mid 30s. 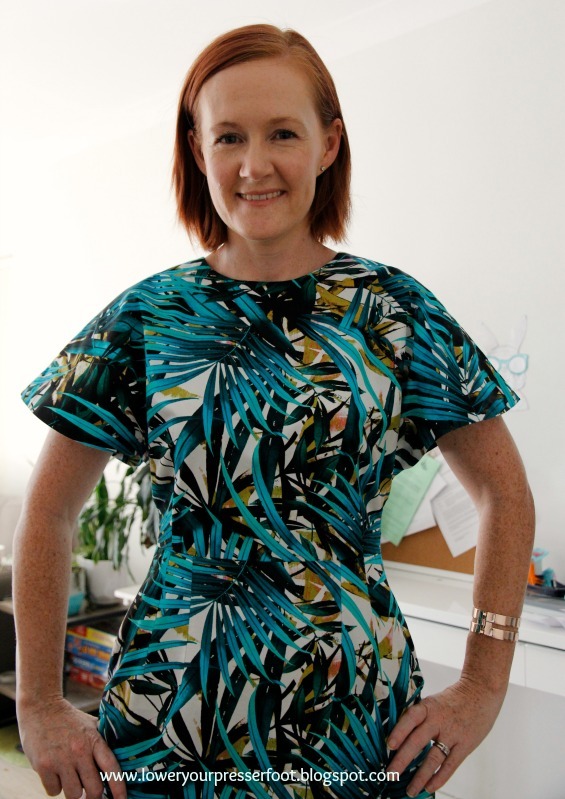 The upside of this very prolonged summer is that I got another wear out of this dress very tropical palm print dress that I made over a month ago. It has been extremely windy the past few days though, hence the inside shots for this blog post. This is Vogue 9021, a very easy Vogue pattern that is still for sale even though it was released a few years ago now. And true to its label it is indeed a very easy dress to sew since it has very simple lines and there's not much to it really except for those sleeves! I bought this on sale at one of Spotlight's fantastic $5 Vogue pattern sales late last year. If you google this pattern you'll see that many ladies have made a version of this but I was particularly inspired to make this pattern by this very elegant navy version over at He Cooks She Sews! and this very pretty floral version by Gabrielle at Up Sew Late. 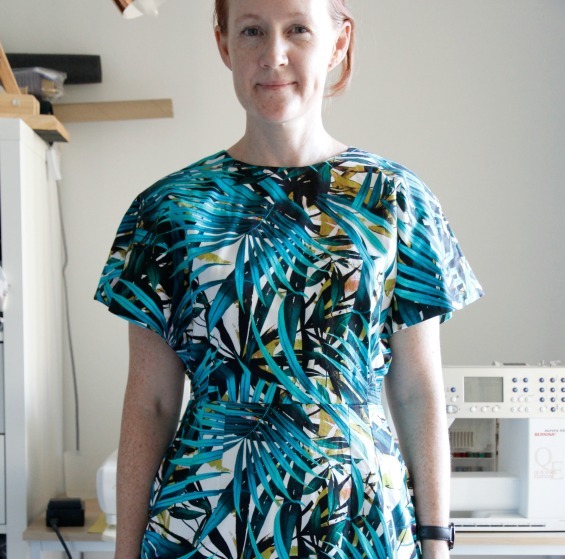 I had been searching for some navy blue crepe to make this dress, but I ended up using a very colourful palm print cotton sateen I purchased from Gardams Fabrics in Brisbane at the beginning of this year so in a way I was very influenced by both versions. As I said, those sleeves are the stand out feature of this pattern and the extreme batwing / fluttery shape really caught my eye. 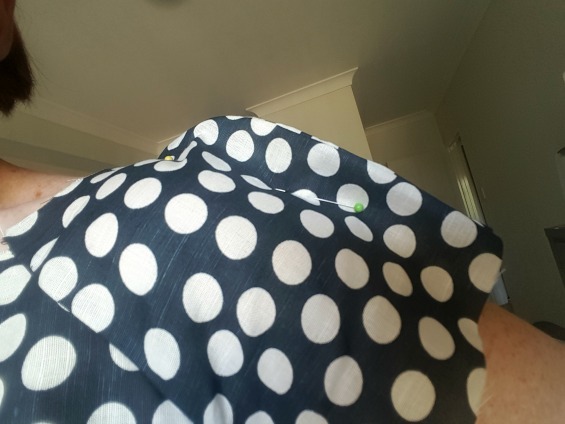 I tried to think of a clever solution, such as making a gusset from the dress fabric that would be sewn from the front darts around the side to the back darts, or perhaps a camisole style top to be an under layer and also attached to the waistline. But it's been too hot to think in these parts and certainly too hot to wear more layers of fabric than necessary so I just did what everyone else had done and sewed up the side seam a little higher until it was decent. Sewing the side seams up higher does change the look and the way the sleeves fall though. In the photo below, you can see how the sleeve on my left side where I've pinned the side seam up to my bra strap looks more like a traditional sleeve than my right shoulder where it seems the fabric is just draped around my shoulders. But it was a change I had to live with if I didn't want every one to see not just my bra but my blindingly white midriff as well, and really the change is probably subtle anyway. Once the sleeves were resolved, the rest of the pattern is very simple and easy to sew. 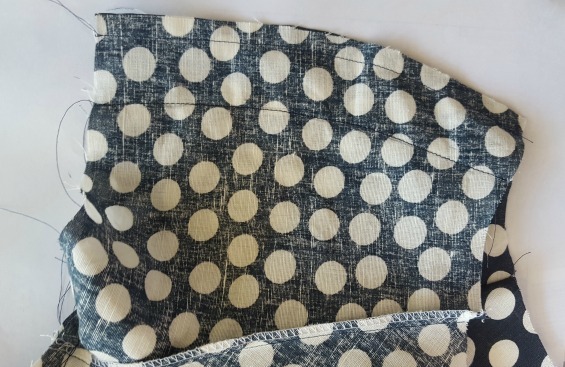 The back skirt has a split along the centre back seam which isn't my favoured treatment because it has the tendency to tear open but when I was cutting out the pattern I forgot to add extra width there to make a vent so I was stuck with it. The dress is not too tight though, so it should be ok. Even though this dress used a lot of fabric because of those extremely wide sleeves, I had some leftover fabric that I managed to eke out a Style Arc Skye top. 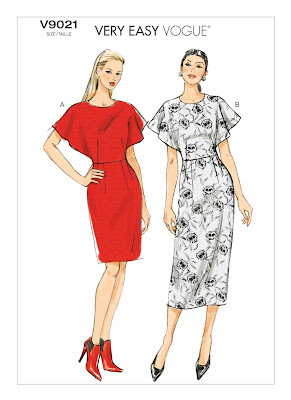 This is my go to pattern for a simple top because it doesn't use much fabric and is very quick to sew. I think this might be my fourth or fifth version. Whilst it's still very striking in this fabric, it's a bit more versatile than the dress because it looks great when worn with pants or jeans. I'm pretty happy that I finally found the right fabric to make this dress, and that I made the most of the beautiful fabric. Gotta love it when things just work out just the way you want them to! So here we are at Easter at the beginning of April and it's still sweltering hot here in Sydney. For all of you in the northern hemisphere where it's still snowing I'm sure we share the same sentiments - enough of this extended weather patterns, it's time for a change in season! But it has given me an opportunity to finish and wear another summer dress that I cut out at the beginning of the year but hadn't yet finished. I tend to cut out a lot of projects in batches to make the most of my sewing time, but the danger in that approach is that sometimes I don't get around to finishing them and they become UFOs. Not this time though! This is New Look 6013, one of those wardrobe patterns with a few different garments in one. I bought this pattern from one of those marvellous Spotlight bargain sales mainly for the jacket because I love a shawl collar. I hadn't really planned on making the dress because I have two other similar patterns (Burda 3/2009 #107 and Vogue 8319) which I made the Vogue dress way back in 2010 in this post. I loved that dress and only stopped wearing it because after many washes the fabric was very faded. I can't believe I made that dress eight years ago now - time does fly by! So I did a quick and a bit dodgy fix which worked out fine. While I was wearing the dress I lifted it up by the shoulder seams until the dress felt like it was in the right position but not too tight under the arms and basically pinned out a new shoulder seam. I sewed a new seam line almost 4cm lower than the original shoulder seam, so you can see how much excess space there is in that area. I checked the pattern pieces to make sure I didn't cut out a larger size (it's a multi sized pattern) but I cut the right bits out so I can't explain it. Lifting it up at the shoulder seam also brought the hem up to the right spot for me so this fix sorted out a few problems. It still sits a bit low at the front and back neckline but it's not inappropriate so I can live with it. Apart from that fitting issue it's a pretty straight forward pattern. The princess seams make it easy to get a nice fit through my sway back, and it has a vent to make it easy to walk in. I've fully lined this in a thin cotton lawn in white because the polka dot fabric is a bit see through but it doesn't add any bulk to the dress. I haven't made this overly fitted like I usually do - I figured a good bit of ease is necessary for a summer dress and I knew this fabric would probably bag out a little anyway. Whilst I like how this dress turned out in the end I'm not sure I'll make this pattern again, mainly because I prefer how the Vogue pattern that I made previously fits much better than this one. But with the high temps we're having at the moment it's just what I needed.